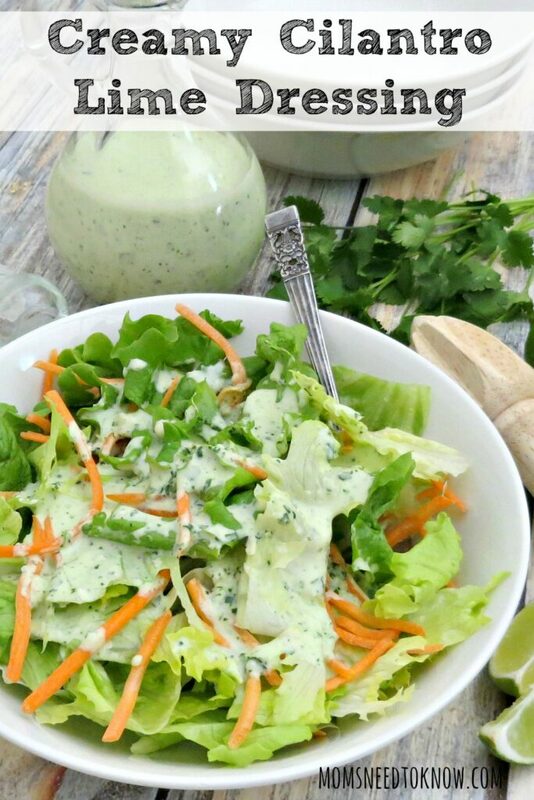 This creamy cilantro lime dressing can be used as a dressing for salads or as a light sauce for meats. It's absolutely delicious drizzled over my blackened fish tacos! With the weather being so unseasonably warm recently, I have been thinking about salads more and more. Soon I will be planting my herb garden and we always plant cilantro. If you have ever grown cilantro, you know that it can quick take over everything…so we are always looking for something to make with it besides my homemade salsa! The cilantro is the star of the show in this dressing. The flavor is prominent, and it should be. Honestly, I could have even added a little more. Feel free to play with it. Add more (or less), or throw in some other herbs! 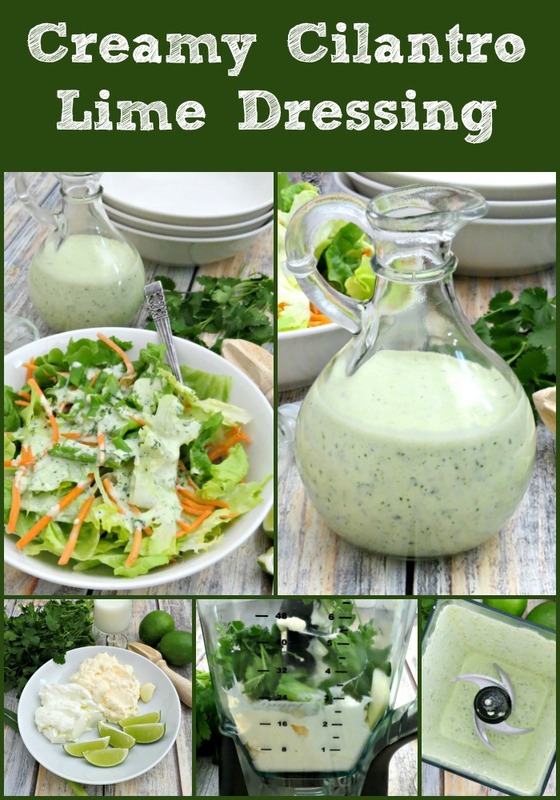 The lime brings out the flavor of the cilantro and adds a citrusy, freshness to the dressing. The Parmesan was a last minute decision and gave the dressing the extra body and flavor I was looking for. Wait until the dressing is done before you add salt. The Parmesan adds quite a bit, so I only needed a pinch. If you like a little spice, you could add jalapeño in the blender or stir in a pinch of red pepper flakes at the end. When I use it on my fish tacos, I will even add some chipotle in adobo sauce! Since the garlic is raw, it's important to really break it down. Although we love garlic, it can be very strong when it's raw. 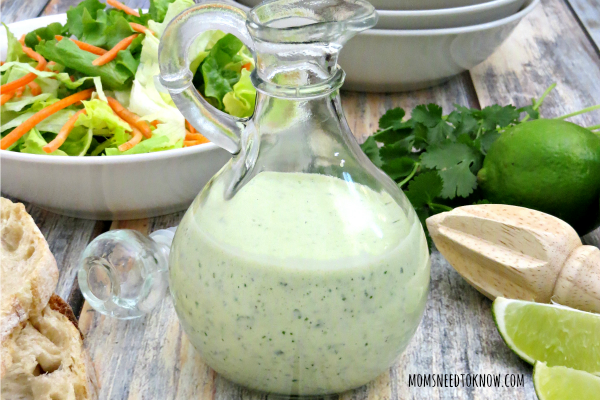 This creamy cilantro lime dressing can be used as a dressing for salads or as a light sauce for meats. It's absolutely delicious drizzled over fish tacos! Add the garlic and olive oil to a blender and blend for a few seconds to break down the garlic. Add the mayonnaise, yogurt, Parmesan, lime juice, vinegar, honey, green onion, and half of the cilantro and blend until completely smooth. Stop and scrape down the sides as needed. If you need to thin the dressing out, add a tablespoon of milk at a time. Or, if you like a lot of lime, you could add additional lime juice, but be sure to taste it before you do that. Add the remaining cilantro and pulse to break it up. This gives beautiful flecks of cilantro running through your dressing. If you want it completely smooth, you can add it all in the second step. Oops! Sorry about that! It’s 1/4 cup! Fixed the post! This dressing looks amazing! Pinned for later. Thank you for sharing at Merry Monday! I just bought cilantro so this recipe is perfect timing! It looks so crisp and refreshing! Thanks for linking up with Delicious Dishes Recipe Party!